What came in the mail? 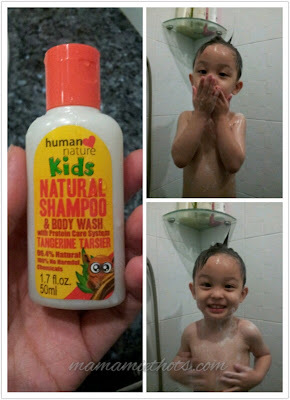 Human Nature Natural Moisturizing Shampoo - Mandarin Fresh﻿, Natural Moisturizing Conditioner - Mandarin Fresh, Kids Natural Shampoo & Body Wash - Tangerine Tarsier, Kids Natural & Body Wash - Pineapple Pawikan & Citronella Bug Spray. I used to be quite adventurous with my hair. I coloured, bleached, rebonded & permed my hair throughout the years & I can say that my hair is quite dry & brittle now. When I tried the shampoo & conditioner, my hair felt soft & light. I received rave reviews from my older kids, they claimed they loved the smell & their skin felt so smooth. My daughter even commented that her hair did not tangle up when she combed her hair. 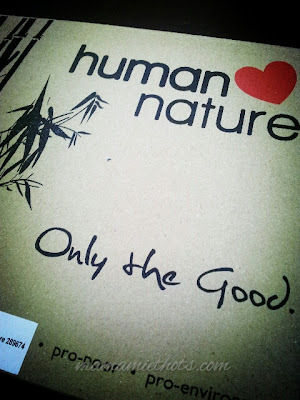 The best part is all their products are organic & their pricing will not burn a hole in your pocket :) Too good to be true? In fact, Human Nature products cost 2 to 3 times less expensive than some other products which I've tried before. # First range of affordable & genuinely natural products in the Philippines. 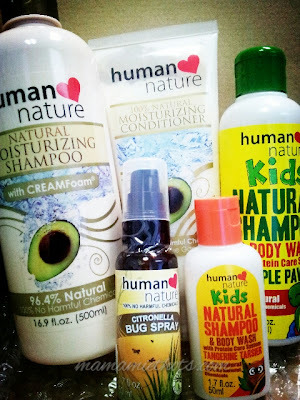 Simply key in the promo code "MAMAMIE20" to enjoy 20% discounts when you make any online purchase at HUMAN NATURE Singapore website. You can log on to their FB page for more information. The lucky winners will be announced on 11th March 2013 on this blog & notified by email. Good luck! Disclamer: We received a set of products for review purpose, all opinions are of our own. wouldlove to win a set. have liked and.registered, thanks! Would love to try this before investing in a full-size bottle! Looking for a product that will not irritate my 17mth girl's eczema-prone skin. I want the FREE gift!!! 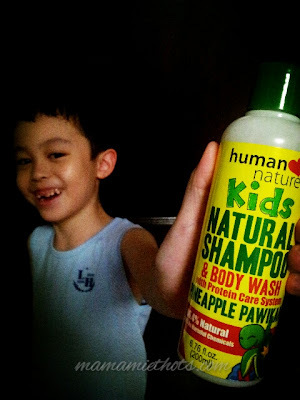 I recently bought HN products for the kids and like them! Would love to win the products! 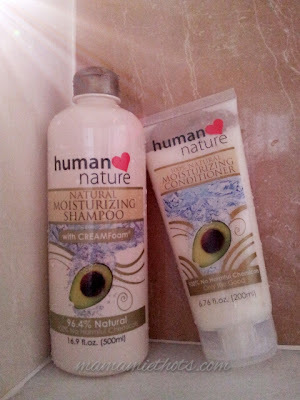 Hi, I'd love to try HN's organic products.